• Lapiss is a superior desensitizing agent that can be placed under dental cements or other restorative materials, temporary, provisional or final. Lapiss can be used in all restorative procedures where work in done in dentin. It has been shown to improve bonding strengths when used as a wetting agent, as compared to water. Lapiss can be used for desensitization of amalgam restorations, either conventional or bonded. Lapiss helps kill bacteria, alter nerve responses and aids bonding primers in penetrating etched dentin. 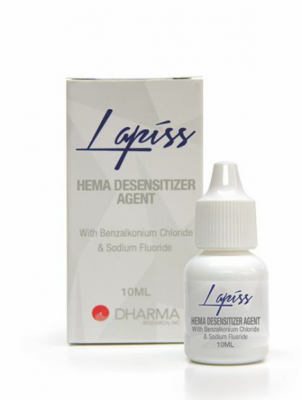 • Lapiss contains benzalkonium chloride, HEMA and fluoride as an added source of fluoride ion. • Lapiss is very effective when applied to vital crown preparations prior to luting with Glass Ionomer and Zinc Phosphate cements. It may also be used at the preparatory appointment to desensitize during temporization. Complete desensitization will result in nearly all preparations when Lapiss is used properly in conjunction with these cements. • The application of Lapiss reliably reduces post-op sensitivity by supporting the collagen framework for easier penetration of the adhesive, thus enhancing the dentin bond. Most dentin bonding materials such as: All Bond 2, Optibond, Scothbond, etc. will benefit from the application of Lapiss. • Lapiss can be used to eliminate post-op sensitivity under standard amalgam restorations. When using Lapiss, minimize contact with soft tissue and rinse well at completion of desensitization procedure. This will reduce the chance of mild soft tissue irritation. • Clean tooth prep area. • Apply Lapiss to dried tooth using a brush or a cotton swab. Avoid contact with soft tissue. • Wait 30 seconds and then dry with air. • Place restorative material such as amalgam, castings, etc. Lapiss will work well with zinc phosphates and glass ionomer cements. • Etch surface as per manufacturer’s instructions. • For bonding systems that use primer in etchant (Clearfil SE) apply before the primer. • Dry with air (dryness is not critical). • Apply Lapiss using a brush or a cotton swab. Avoid contact with soft tissue. • Wait 30 seconds, then dry or leave moist, per manufacturer’s instructions for the bonding agent. Do not rinse at this stage. • Direct Restorations: Apply composite bonding agent and composite as per manufacturer’s instructions. • Indirect Restorations or sealing preparation: Apply composite bonding agent and luting resin as per manufacturer’s instructions. • Prepare surface to be treated. Clean with prophy paste (recommended but not required). • Minimize contact of Lapiss with soft tissue. • Apply Lapiss using a brush or a cotton swab. Lightly burnish in for 10 seconds. • Air dry for 20 seconds. • Prepare surface. Clean with prophy paste. Rinse thoroughly. • Lapiss should be used before whitening on all patients that have a high degree of sensitivity. For other patients Lapiss should be used after a whitening procedure. • Gently dry the sensitive area with a cotton pellet or roll to remove excess moisture. Apply Lapiss by gently rubbing it in for 10 seconds. Air dry, and repeat one more time. Avoid contact with eyes, skin and mucous membranes. If accidental contact occurs, flush immediately with water. Consult physician immediately if eye contact occurs. Keep away from children. The lot number and expiration date is placed on each Lapiss bottle. Lapiss has a three year shelf life when kept below 25 degrees Celsius/77 degrees Farenheit.